Wireless headphones are now a mature segment within the audio market, with the old advantages of wired audio firmly a bygone concept. These German engineered Teufel Real Blue NC Headphones are trying to be a definitive £199 mid-range wireless pair that could have the advantage over the competition with unique touch based controls. The headband and ear-cups are mainly a black offering, but the outer ear-cups are neatly contrasted with a silvery tone on each side and there is red stitching on the interior of each side. 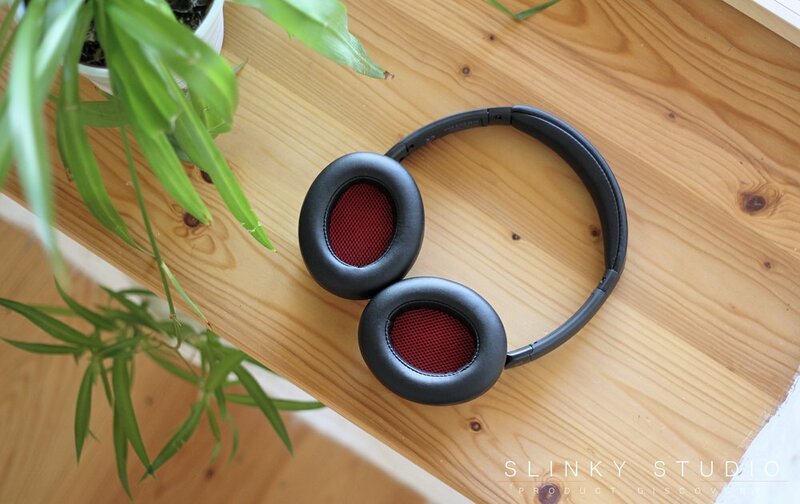 These headphones don’t skimp on the padding, producing what we would describe as a cloudy comfort above those of recent pairs we’ve reviewed, which is heightened by the looseness of adjustable length and swivel from this pair. What’s more they fold away into themselves so they take less room in your bag; or you can use the supplied in the box travel case. We are using the Real Blue NC headphones almost exclusively wirelessly, but if you want to use an AUX cable there’s a flap on the bottom of the right ear cup to reveal a port and the micro-USB charging port. Inbuilt into the side of the right ear-cup is the touch sensitive control pad. We don’t often read manuals, but on this occasion, despite several attempts, the input method remained a complete mystery. However, after a 30 second scan of the supplied literature, we were in the know. So a centre tap pauses and plays music; a swipe upwards increases the volume level and downwards decreases this; a left to right swipe goes back on a track and doing the opposite skips to the next track. When you get into the rhythm of using these remarkably accurate controls, we can safely say they’re more pleasurable than buttons. All the devices we had the Teufel Real Blue NC headphones paired with made full use of Bluetooth 4.0. Our experience was that they are quick to pair, have zero lag or any kind of audio distortion and the 15 metre range wasn’t bad either. Battery life achieved with noise cancellation turned on was an impressive 22hrs, with it off we would expect to achieve 2-3hrs of extra runtime. The hybrid noise cancellation is one of the best examples of the technology we’ve yet to come across. The scattering of microphones on these headphones keeps pace with environments where harsh noise is intermittent. Its effectiveness is unquestionable, minimising loud clattering machinery to a gentle tapping. Whether your preference is for noise cancellation or not, it doesn’t really matter in terms of audio quality, because it is difficult to distinguish differences in the resulting quality of the output either way - and that’s simply not the norm with noise cancelling headphones. In terms of the quality of audio produced, the Real Blue NC’s have a warm sound style and after playing a varied catalogue of genres through them, the overall listening experience has a distinct charm. 'L-O-V-E' by Diana Krall showcases the headphones impressive tonal bass qualities and that the volume levels deliver reasonable clout similar to the SACKit TOUCHit headphones. What’s more, energetic lower frequency ranges don’t soak into the rest, so harmony between the high, mid and low ranges is generally mastered by this pair. Just once in a while higher ranges, and we stress very rarely, become a tad too harsh; it’s only really noticeable with certain vocal arrangements where specific letters can sound over pronounced. There's no doubt these are perfect companions for the spoken word, so with YouTube videos and podcasts these are a firm favourite pick at the studio. We have great admiration for the Teufel Real Blue NC Headphones' sizeable soundstage. This gives true distance between the vocals and instruments, which does real justice to songs like 'Clap Your Hands' by Whilk & Misky - with unique details such as the tide rushing in and out not missing out on the fun. The distinction between frequencies, together with a soundstage which actually exists, infuse together for a truly immersive performance which is not as common as you’d imagine within this price range. The bar for noise cancellation performance has now been raised, and where comfort is concerned Teufel have engineered a faultless pair of headphones that make hours of uninterrupted listening an absolute pleasure. But most importantly they’ll do your music library absolute justice, with rich detail and overall wireless performance that is in no way inferior to dynamically engineered wired headphones.